Trainer Bob Baffert and owner Ahmed Zayat (right) watch American Pharoah gallop on the training track. In a very welcome change from earlier in the week, the sun was out Thursday morning during training hours. However, more than 2 days of steady rain downgraded the main track to muddy and the turf course to soft, while the synthetic Polytrack surface at the 5 furlong training track was "fast" as always, with temperatures near 50 with a light cold breeze. 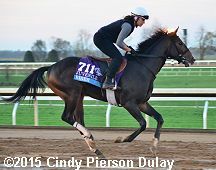 Horses that arrived from Ireland on Tuesday cleared quarantine on Wednesday afternoon and got to test the Keeneland track today. 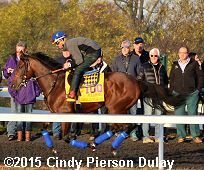 Triple Crown winner and Classic favorite American Pharoah made his first appearance at Keeneland, going to the training track as many onlookers rushed down the hill from the main grandstand to get a look at him. 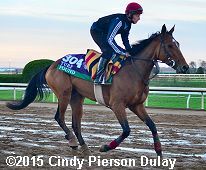 Here are photos for 38 of the horses on the track Thursday morning. Click the small picture to see a larger version. 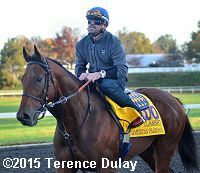 American Pharoah (Classic) galloped twice around the training track. Trainer Bob Baffert said, "We took him out to the (Polytrack) training track because when we checked out the main track yesterday afternoon it looked pretty wet still, and when it starts to dry out, it can get a little deep." American Pharoah (Classic) returns from his gallop. Baffert added, "He's at his peak he's happy and he's doing really well. He's going to come out of there running. They still have to get the trip and we're hoping he gets a clean break, a clean trip and a good trip." After returning to the barn, word spread that Baffert felt that Alvarez galloped the colt too long and too fast. Beholder (Classic) galloped twice around the training track about 10 minutes before American Pharoah arrived there, but at the barn was found to have bled and was scratched. Trainer Richard Mandella said, "This was obviously due to the fever she had when she arrived. Knowing this, we feel it is too great a risk to start her in the Classic. There's obviously some irritated lung tissue there. She will be fine, but if I put her under the pressure of a race situation, it could cause some real damage." Golden Horn (Turf) tested the soft course for the first time under jockey Frankie Dettori. Trainer John Gosden said, "He probably has the most remarkable constitution of any horse I have trained. He has grown physically in the course of his three-year-old year and matured. Ideally I would like to be coming to a race like this with a four-year-old or five-year-old, but he's retiring and going to stud, so this is our only shot at it." Effinex (Classic) returned to the main track to gallop Thursday morning after exercising under the shedrow the morning before. "He was bouncing around from trainer to trainer and it looks like he wasn't getting the continuity he deserved. 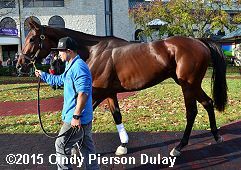 Being in one place, one program, he kept getting better and better as we went along," trainer Jimmy Jerkens said. 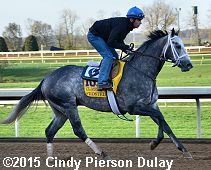 Frosted (Classic) galloped a mile toward the outer rail of the main track. Trainer Kiaran McLaughlin said, "We might all be in trouble if (American Pharoah) is left alone on a 47 and change�half-mile. We'll find out how good (Frosted) is, but he's going to run his race." Gleneagles (Classic) jogged one mile wrong way then cantered one mile under jockey Joseph O'Brien. O'Brien said, "The dirt is still a bit sloppy, but better than it was and they are saying that there will not be much more in the way of rain. My horse has a lot of pace, he's a good mover who travels and can quicken and while it is a shot into the dark, he has a great constitution. I think we will know after a couple of furlongs, if he's travelling and happy, he is in with a shout." Smooth Roller (Classic) jogged on the training track. Trainer Victor Garcia, with his first Breeders' Cup runner, said, "We schooled him in the paddock and then took him to the track this morning. He jogged two miles. He's feeling good." 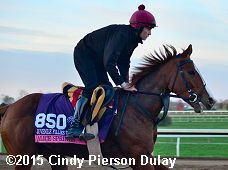 Tapiture (Dirt Mile) schooled in the starting gate and then galloped twice around the main track. Trainer Steve Asmussen said, "He's full of himself right now." 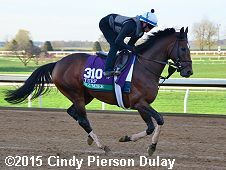 War Envoy (Dirt Mile) galloped 1 1/2 miles on the main track. 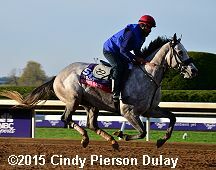 Wicked Strong (Dirt Mile) schooled at the starting gate and galloped 1 1/4 miles on the main track. "The way he started running at the beginning of the year, you might feel that. The way he was acting, there wasn't any difference, but he didn't have the 'oomph' that he had," trainer Jimmy Jerkens said. "I think he got it back from Saratoga on. He's certainly a better horse than he was in the spring." 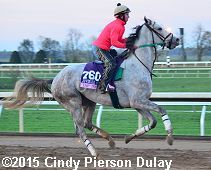 Peace and War (Distaff) galloped 1 1/2 mile at Keeneland Thursday morning. "(Post 14) is not ideal. There's nothing I can do about it. There looks like there's plenty of speed in there," said trainer Graham Motion, noting Peace and War's late-running style. "I think the 1 1/8 mile suits her. I think she's been looking to go a little further." Cavorting (Filly and Mare Sprint) cantered on the main track. Legatissimo (Filly and Mare Turf) stretched her legs alongside a pony out on the main track. The daughter of Danehill Dancer completed a couple of laps of the track at a steady canter before returning to the barn. 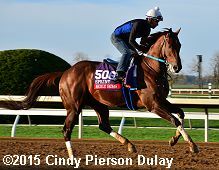 Conquest Big E (Juvenile) galloped twice around the main track. "Hopefully, he's learned a lot in his first two races and we'll need to draw on those experiences," said trainer Mark Casse. "Our biggest concern is he can be a little bit of a (pain) in the gate and he's going to have to stand in there a long time. He can be a little bad but we've been schooling him and he's really matured." Swipe (Juvenile) walked the shed row of Barn 66 and schooled in the paddock (shown here) for trainer Keith Desormeaux. Waterloo Bridge (Juvenile) went out for a 2 mile gallop on the main track. Ma Can Do It (Juvenile Fillies) galloped 1 1/2 miles on the main track. "She had two good seconds (in sprint maiden races) and I thought stretching out would improve her and she ran a good third," trainer Dale Romans said. "She's trained well since that race"
Tap to It (Juvenile Fillies) went out for a routine gallop over the main track. 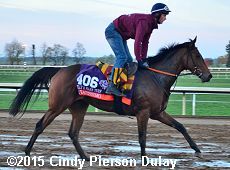 Alice Springs (Juvenile Fillies Turf) the Irish challenger in the $1 million Breeders' Cup Juvenile Fillies Turf went out onto the dirt, jogged a lap before doing another circuit at a hack canter. Highland Sky (Juvenile Turf) galloped twice around the soft turf course. Hit It a Bomb (Juvenile Turf) went out on to the dirt with the other Ballydoyle horses. 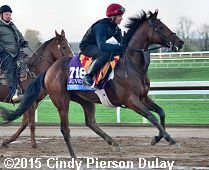 Shogun (Juvenile Turf) went out on the dirt track with his Ballydoyle stablemates. Karakontie (Mile) worked 3f on soft turf in 39.40 seconds. 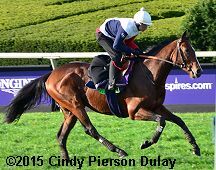 Mondialiste (Mile) worked 3f on the soft turf in the same time as Karakontie, 39.40 seconds. Time Test (Mile) went two laps of the turf before schooling in the paddock and returning home. His trainer Roger Charlton was trackside to see the son of Dubawi was happy with what he saw. Big Macher (Sprint) galloped 1 1/2 miles main track. Holy Boss (Sprint) went out for a routine gallop over the muddy main track. Kobe's Back (Sprint) galloped 1 1/4 miles on the main track. Wild Dude (Sprint) galloped 1 1/2 miles. His last effort was a victorious one, where he took the Santa Anita Sprint Championship in come-from-behind fashion. Trainer Jerry Hollendorfer admits that he didn't want Wild Dude quite that far back. "For me, I was thinking 'Rafael (Bejarano), what are you doing right there?' but apparently he knows more about how to rate them than I do," Hollendorfer said with a laugh. "That worked out well. He got a good fast pace. I don't know what the pace will be in the Sprint, but I suspect it will be plenty fast." Big Blue Kitten (Turf) named after the colors of the nearby University of Kentucky, will be the local favorite. "I would hope so, with a horse with such strong ties to Lexington," Chad Brown said. "The horse was born and raised here by a family that is very prominent here in Kentucky. And they love their Big Blue Wildcats. Any advantage we can have, any large fan base, we'll take it. I always think that gives you a little edge." Cage Fighter (Turf) galloped 3 times around the training track. "The thing that excites me about this horse is that he beat some quality horses over soft turf in a stakes at (Parx) two back and then in the Knickerbocker � which was much better than a normal Grade 3 race � he had a nice burst at the top of the lane," trainer Chuck Lawrence said. "Then he galloped out so well that they needed an outrider to get him. I think the 1 1/2 mile will be perfect for him. Everything he does tells me he wants to go farther." Lawrence has 1 other Breeders' Cup win, as a jockey in the 1994 Steeplechase. Found (Turf) did a similar piece of exercise to Gleneagles in doing two circuits of the main track one at a jog and the other at a hack canter. Slumber (Turf) galloped 1 mile 3 furlongs on the muddy track. The Pizza Man (Turf) represents the state of Illinois as the Arlington Million winner and an Illinois-bred. 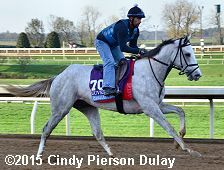 He galloped 3 times around the training track with jockey Florent Geroux aboard. Bobby's Kitten (Turf Sprint) galloped 1 3/8 miles on the main track.